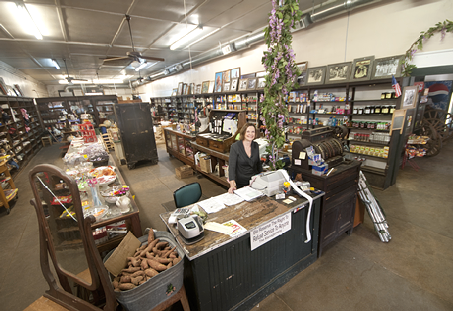 Phyllis Crady, co-proprietor of Carroway’s General Store in Ida, Louisiana carries the torch for a tradition that began in 1926. The store started then as Perry Mercantile. The store and restaurant are managed and operated by a complete staff of women. I am advised by good authority that Carroway’s General Store and Restaurant and store will reopen in February, 2014. Ain’t that grand! Unfortunately, Carroway’s General Store has fallen victim to the economic pressure of the times and is now closed. The windows are not boarded and the external appearance remains essentially the same as what you see in this post and on Corndancer.com. This story had its beginnings on the Photo of the Week page at Corndancer dot-com. To see other pictures of Carroway’s and get in on the start of the story, click here, a very cool thing to do. 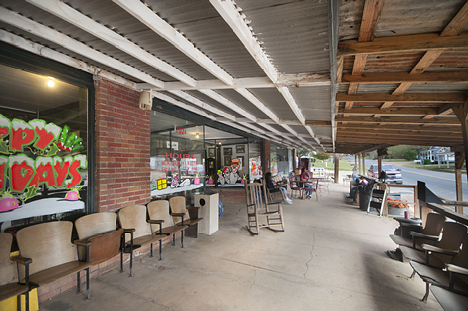 A succession of owners since 1926 have kept structural and equipment changes to a minimum at Carroway’s General Store in Ida, Louisiana. The store started business as Perry Mercantile. Two years after they started the business, the Perrys sold the store to the Carroway’s who operated it for forty years. Since the store left the hands of the Carroways, it has gone through several ownership changes. Most of the time, when a business changes hands a lot, it tends to lose its original identity, pandering to the current ego-in-charge. Carroway’s has not suffered that fate. Carroway’s front porch is an inviting and relaxing place. It provides a place for “visiting,” and work breaks. It is also a popular venue for politicians making election year “stump” speeches. Former governors Huey P. Long, Earl Long, and musician-turned-governor Jimmie Davis are among the notables who have availed themselves of Carroway’s front porch. 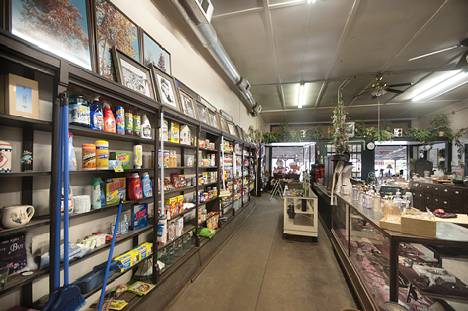 Carroway’s General Store shelves stocked with lots of merchandise, old and new. And it’s all for sale. The shelves and glass cases are have been in the store since day one in 1926. Carroway’s is more than a store. It is also a first class restaurant with a loyal following originating locally and from a fifty-mile radius of Ida. Customers from Shreveport and Bossier City, Louisiana; Atlanta, Texas, and Texarkana USA show up on a regular basis for breakfast, lunch, and supper, (OK dinner if you insist). 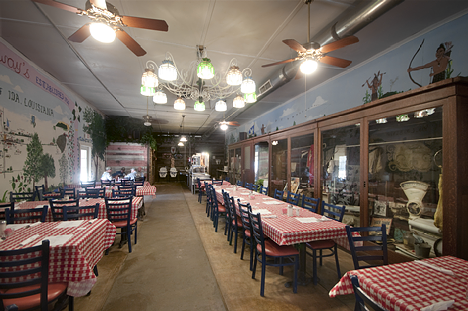 Carroway’s General Store Restaurant keeps the down-home tradition in its decor. The glass cabinet to the right contains an eclectic collection of memorabilia. To the curious and to antique aficionados, the cabinet collection is a meal for the eyes, as the menu is for the tummy. 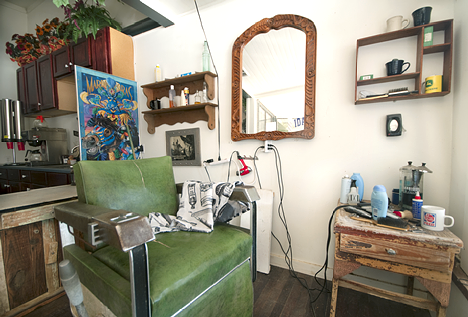 As if a fine general store and a first class restaurant were not enough, the Cradys reestablished the Ida Barbershop, yes a real live barbershop in the store. The barber, JoJo Norton is in the shop every Saturday from 8:00 a.m. – 3:00 p.m. and during the week by appointment before 9:00 a.m.
JoJo Norton’s Ida Barbershop in Carroway’s General Store. A shave and a haircut in today’s economy are somewhat more than six bits, but well worth the trip. It is probably not a “discovery” to the Cradys that keeping valued traditions alive and well is good for business. In fact, from all outward appearances, it just comes naturally to them. It is said that marketing is “finding out what people want and giving them more of it … and finding out what they don’t like and giving them less of it.” It appears that a succession of Carroway’s proprietors were and are in tune with that concept. Works for me. It ain’t the slime from Hades that ate Brooklyn surrounding the bear. It’s common duckweed. This critter compendium started on the photo of the week page at Corndancer dot com with a gray fox and some ‘gators. To get in on the start of the festivities and see the critters, click here. We’ll wait while you look. The black bear is swimming in the pond of the swamp area at Audubon Park, otherwise known as the New Orleans Zoo. Mind you, this shot was made with film around the mid nineties, so the bear and the pond are not the same, if at all. When you first see the image, you say, “ … yuk, gah-rohss, eeetch!$#@! … ” look at the bear in the slime. The green stuff is neither algae nor slime; it is duckweed, a prolific, emerald green aquatic plant that will cover a pond quickly. 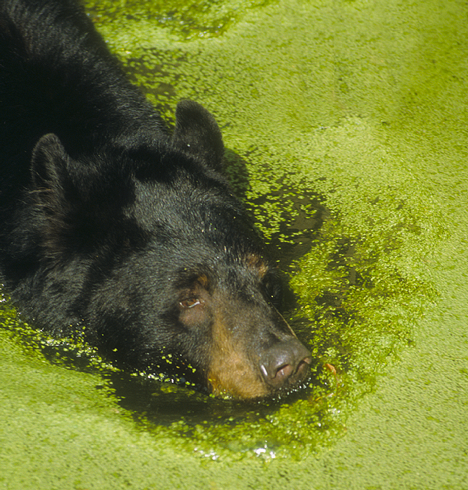 What appear to be green freckles on the bear’s muzzle are duckweed leaves. It is an inordinately warm day in mid-April and brother bear has opted for a dip to cool the savage beast, duckweed notwithstanding. Now where in the $#@!! !^%* did I leave that lottery ticket? Not far away, perched high above the ground is a monkey, the genre of which escapes me. He looks like he is wearing a roaring twenties raccoon coat. One thing I do know, it appears that his left ear is itching because he is vigorously scratching in that direction. He looks like he has just lost his lottery ticket. Folks, these critters are why we go and gladly pay to get it. Go forth, learn and enjoy. 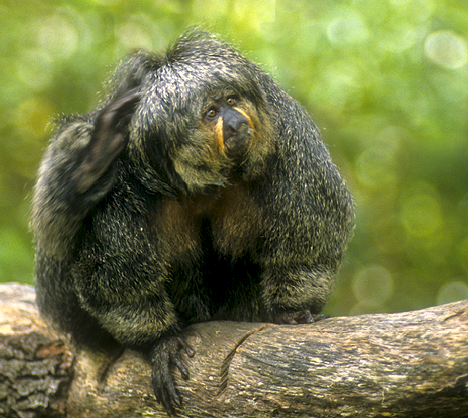 What, you say, do monkeys, bears, and locomotives have in common? At first blush, nothing. Howsomever, these three do. They share a residence in my film image archives. This week, in-lieu of plying the highways and byways for Grist matter, I groveled through the archives. From a technical standpoint, for those of you interested in photography, this image took a bit of unconventional chicanery. I knew I would not get to see the engine until the afternoon of that day, which, unfortunately meant the business end, which you see above, would be in the shadows. So I took a couple of 600 watt studio strobes and about a 175′ of extension cord to the rail yards and blasted 819 with a sterilizing dose of strobe to get the shot. I got some really weird stares and a couple of mild electrical shocks since steam engines cast off water, but, in the end, I got the shot and that was what counted. The images on this post are all in the 14-15 year old range, shot on Fujichrome 100. The 819 was built in the Cotton Belt Shops at Pine Bluff, Arkansas in 1943. The locomotive was in regular service on the St. Louis and Southwestern Railroad, more popularly known in theses environs as the Cotton Belt Line, until 1955 when it was retired. The mighty locomotive was placed on permanent display in a city park in Pine Bluff where it remained until December 1, 1983 when a group of enthusiasts put the engine back on rails, returned it to the shops where it originated and meticulously restored it to the last minute detail. There is much more to this story than this synopsis, most of which you can find here. 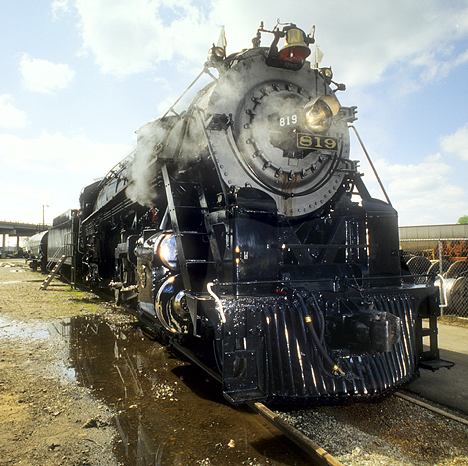 The 819 is currently housed in the Arkansas Railroad Museum in Pine Bluff, Arkansas. May 6, 2012 update. The 8i9 is now disassembled and “on hold.” See a Corndancer article and a companion Weekly Grist article from 2010 which give some explanation of the 819 dilemma. Where is this building (or where was it)? This old build is (or was) in plain sight, visible for a long way in either direction on the highway where it was located. Where, was that, within 100 miles? Who will be the first to tell me where this building is, within a hundred miles, or so, a generous latitude of locations? 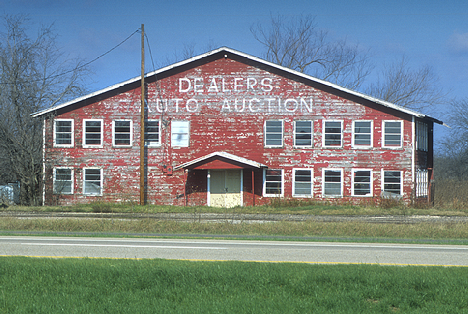 I have passed this old structure a number of times and finally photographed it about 15 years ago. It’s been seven years since I have been past the building, so I am not certain that it is still standing. Who knows, it could have been razed or simply collapsed. For those who want to participate, email or post a comment below? Hint: It is west of where I live. I will reveal the answer (within a 100 miles or so) next week, it not sooner. The supply of stuff to see in the Delta never seems to run dry. Well, from a tongue-in-cheek standpoint, right now, at 18-24″ or so of rain over average, depending on where you are, precious little in the Delta is “running dry.” As our trip progresses, we actually leave the Delta, but you can’t tell from lookoing. Weather comments notwithstanding, in this edition of Weekly Grist for the Eyes and Mind, we again meander around the Delta, seeing stuff. The trip started through a tunnel of pecans trees south of Scott, Arkansas. Click here to see two pictures of the tunnel and get in on the start of the story on the Photo of the Week page at Corndancer do com. What’s left of the “big” house on the Tucker Plantation, Tucker, Arkansas. Families lived here, deals were struck here and a large farming operation was once managed from this formerly imposing residence. The Tucker Plantation, at Tucker, Arkansas was established in 1871 according to local signage. In the rich soil of the Delta, vines are “happy in their work.” The second floor window would have been to a bedroom, if the floor plan was typical of the day. Typical of farming operations in the day, there was a store and gin which were part of the plantation. The farming part of the operation continues. The residential, retail and ginning parts are things of the past. The model of economic growth for the last half of the twentieth century, and continuing to the 21st seems to summarily jettison “outmoded” entities and let them die on the vine rather than devote resources to a proper burial. Not de jure, but de facto. Rail cars on permanent display in down town Lonoke, Arkansas. Further to the north at Lonoke, Arkansas local organizations have acquired a couple of rail cars which provide a colorful addition to the downtown area of the city. The former depot has also been nicely restored. I was unable to get any information on the Stecks building past an obituary for Carl Stecks who moved his family to the farm in 1932. Northwest of Scott, Arkansas on Bearskin Lake Road, you’ll find this old building which has the appearance of a store of the era indicated by the date on the sign. An obituary for Mr. Carl Stecks says he moved his family to this location in 1932. It further indicated that Mr. Stecks was an innovative and energetic individual. Depending on your point of view, the tree trucks you see, appearing like feet on a George Lucas animation are actually trees in a small body of water at Humnoke, Arkansas. The trees and the water abut the highway on both sides for 75 to 100 yards, or so. When a vehicle is “high-centered,” the four wheel drive is about as useful as wings on a pig. Fortunately, there was a residence just up the road from the site of my temporary insanity. I set out on a short stroll northward. When I knocked on the door and explained to Carolyn Underwood what my problem was, she put me in her SUV and started a search for someone with a chain. The first person she asked, Bobby Peoples, had a chain and was willing to help unstick the truck. He recruited Gerrel Peoples. Carolyn led us all to the tractor which had a grain cart attached. The Peoples quickly detached the grain cart and headed for the stuck truck. They attached the chain and set about to do the deed. Pulling the truck from the ditch was light work for the massive John Deere tractor. My newfound friends steadfastly refused compensation for their services and sent me on the way with their best wishes. Life is good and full of rich experiences, some of which are brought about by temporarily imposed adverse circumstances. These circumstances like most adverse circumstances were self-imposed. Fortunately, there are still good people around who will unhesitatingly jump to your rescue . I stuck a pickup in the big middle of a bunch of ’em. All’s well that ends well. Altar at Trinity Episcopal Church, Pine Bluff, Arkansas was installed in 1929 by the Italian sculptors who created it. To the delight of parishioners, they sang while they worked. Now approaching the 139th anniversary of its first worship service, the sanctuary of Trinity Episcopal Church of Pine Bluff, Arkansas, is an example of timeless design and function. Before the first service was conducted on Christmas day in 1870, the entire cost of some $18,000 to construct the building was paid. See an exterior picture and another interior picture and get in on the beginning of this story on the Photo of the Week page at corndancer.com. Click here to make the trip. Trinity’s distinctive altar, installed in 1929 was crafted by sculptors at Antonia Studios in Florence, Italy. The three ton work of art took nearly a year to the date to be completed and shipped to church. Sculptors from Antonio Studios accompanied the altar and assembled in it the church. They had other talents. My friends, the late Charles and Alice Warriner, told me years ago that the artisans were imbued with the legendary Italian propensity to sing and sing they did as they installed the altar. According to Charlie and Alice, word of these impromptu performances spread quickly and local people gathered to observe and listen. This window, a memorial to Julia Embree Roane, was moved in 1929 from the east wall of the church, (now occupied by the altar), to the southwest corner of the nave. The sanctuary, designed before public address systems were conjured in even the wildest of dreams has acoustic characteristics which give rise to music that will raise the hair on the back of your neck and cover you with goose bumps. The fine organ will rumble the foundation. Add a couple of trumpets or other free-standing instruments and you will hear sounds you will not forget. The music is made here at thte console by Faron Wilson, Trinity's talented choirmaster and organist. The sounds you hear roll from the chambers and surround you with melody and rhythm. The building is truly magnificent. It is well preserved and cared for with all due diligence. But the building is a symbol and its true meaning could be lost were it not for the Christian people who make up the parish, occupy the pews and take up the mantle and follow the teachings of Christ. That my friends is the church. Blog picture reproduction, most of the time, leaves a bit to be desired, so I have posted these photos, the photos from Corndancer and several others in an additional gallery with better resolution. See those pictures here.